(2012.201.B0256.0075, Oklahoma Publishing Company Photography Collection, OHS). Entrepreneur and founder of the multimillion-dollar Cosmetic Specialty Labs in Lawton, Edna Hennessee, the daughter of Henry M. and Elsie Miller, was born in 1919 in Ryan, Jefferson County, Oklahoma. Growing up between Ryan and Terral, Edna Miller graduated from Union High School as valedictorian in 1936. She married Lloyd Roy Hennessee in 1939, and after they moved to Lawton, their children, Marilyn and Odus, were born. Edna Hennessee's interest in cosmetics developed after she received a gift of Merle Norman products. 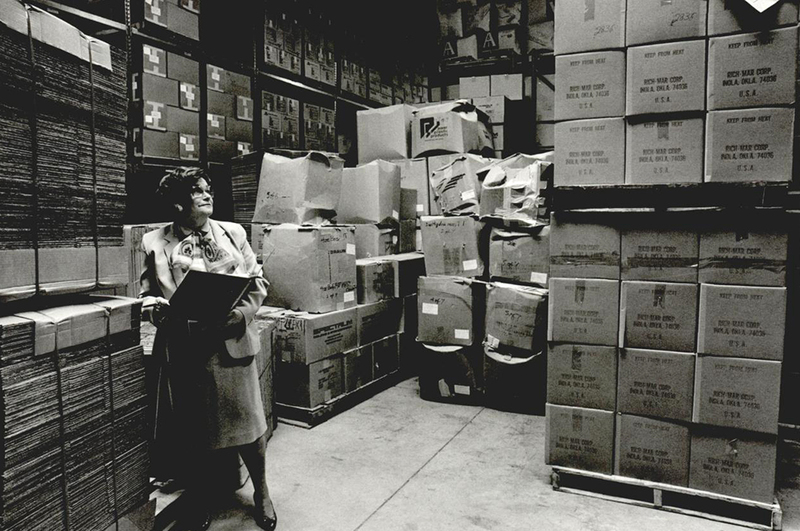 She acquired a Merle Norman franchise in 1944 but decided to develop her own company in 1973. In 1982 she established Dream Valley Farm near Cache, west of Lawton. As a subsidiary of Cosmetic Specialty Labs, the farm is a greenhouse complex where more than thirty thousand aloe vera plants are grown. Aloe is used for a health drink and cosmetics manufactured at the laboratory. The firm supplies private-label products to ninety-seven hundred clients and includes an overseas market. Her son serves as president of the business, which is one of Lawton's largest employers. In 1950 she also opened a beauty salon and skin care facility known as Hennessee Family Center. In 1989 Gov. Henry Bellmon appointed Hennessee to the state vo-tech board. Gov. David Walters selected her to serve on the Oklahoma Commission for the Advancement of Science and Technology, and Gov. Frank Keating named her to the Board of Vocational and Technical Education in 1995. She received Oklahoma's Small Business Administration Award (1992) and was the first woman inducted into the Oklahoma Commerce and Industry Hall of Fame (1993). Her success reflects her winning philosophy of "I don't have to, I get to." Edna Hennessee died on March 24, 2011. Opal Hartsell Brown, Indomitable Oklahoma Women (Oklahoma City: Western Heritage Books, 1994). "Edna Hennessee," Vertical File, Research Division, Oklahoma Historical Society, Oklahoma City. Linda D. Wilson, "Hennessee, Edna Miller," The Encyclopedia of Oklahoma History and Culture, https://www.okhistory.org/publications/enc/entry.php?entry=HE015.